Now offering beginner cello lessons! Whether you have never picked up a stringed instrument before, or are looking to advance your skills, I can help you make beautiful music on your violin or start learning viola or cello. I teach traditional-method (learning to read and produce music at the same time) in the classical style for beginning and intermediate students of all ages. Have a computer? Take your lessons online! Lisa is now teaching violin, viola, and cello lessons online. Online lessons operate the same as in-person lessons and allow you to keep up with your music studies anywhere! I currently bill per month. Invoices will be sent at the beginning of each month for the number of lessons expected during that month. Payment is due on receipt. ​I currently accept cash or check. Payment for online lessons is handled by TakeLessons.com. Ready to start learning your stringed instrument online? Book with me! Lisa offers online lessons thru TakeLessons- book your lesson now! What do I need for my first lesson? - their own instrument and bow. I can assist with finding a quality student instrument to rent or purchase. - a method book. If you already have a preferred method book, I am happy to continue with you. If you have not worked with a teacher before, we can discuss this before your first lesson to find the book that best suits your needs. There are many choices when it comes to method books. 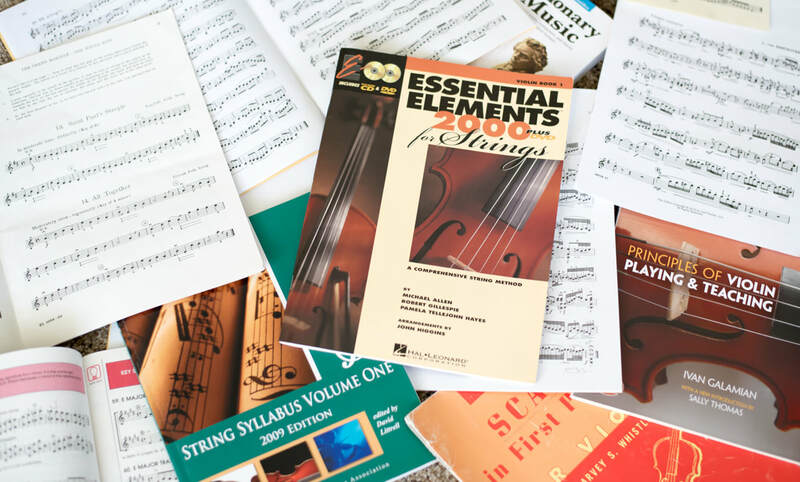 I have worked with: the All for Strings Series, String Builder Series, Essential Elements Series, and others. I am happy to assist with the selection of any of the above items or additional equipment/teaching aids! What to expect at my first lesson? Don't worry! We will discuss the basic parts of the instrument, how it works, how to correctly hold it (and the bow!) and come up with a plan. We may even try and jump in to a few exercises! We will discuss what method books and repertoire you have completed already so that I have a sense of your progress. Then we will discuss your goals and create a plan to reach them! Students should arrive at each lesson on time prepared. If you need to cancel a lesson for any reason, 24 hours' notice is required, otherwise you will be charged for the lesson. If I have 24 hours' notice, I can either credit your account or schedule a make-up lesson. ....is how you get to Carnegie Hall and what makes perfect! Learning a stringer instrument will bring a lifetime of happiness and comfort. Remember- you get out of it what you put in! Contact me today to get started! I can't wait to hear from you!